Following from https://bugs.documentfoundation.org/show_bug.cgi?id=100994 In the meantime, for users that are experiencing the crash (likely on a 5k iMac), please change your color profile (System Preferences > Display > Color) to the Standard iMac Apple RGB profile for the time being. Yeah. Setting this to "Apple RGB" [or Generic RGB] leads to a working LO on iMac 5k. Switching back to "iMac" results in a freeze after the next action in LO. 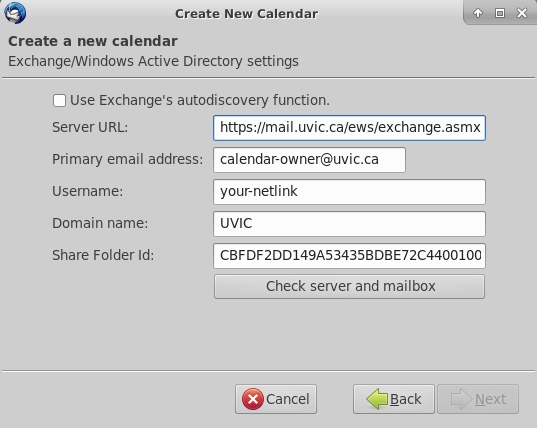 To get Thunderbird working with UVic's Exchange calendar you need to have a version of Thunderbird that incorporates the fix for sending passwords in the clear - this means at least v43. There is a version 44 beta out right now that works quite well, so I went through the process of documenting how I got things going. This also works with v45, which was just made available on the PPA. Add the PPA and install/upgrade in the usual apt-get way. Click the 'Switch to the calendar tab' button (top-right) to view your local calendar (called 'Home'). Add new calendar by right-clicking below your 'Home' calendar, and choose 'New Calendar'. Select 'On the network' for location. Select 'Microsoft Exchange 2007/2010/2013' for format, then name the calendar. Check the 'Hosted Exchange' option, not the 'Office 365' option. Check 'Use Exchange's autodiscovery function. Fill in Username (Netlink ID) and Domain (UVIC). Click 'Perform autodiscovery'. You should be challenged for a password. We have a shared calendar for vacations and so forth. To share a calendar, log in to the account that owns the calendar (through OWS) and right-click the calendar you want to share, and choose 'Share calendar'. In the dialogue that appears, add the email address of the person you want to share with (note that this can only be a UVic email address). It will send an email to this person that has an XML attachment. They can create a new calendar based on the information included in this attachment. The email that the share recipient gets has an XML file attached (called 'shared_metadata.xml'). It contains two things we need: SmtpAddress, which is the email address of the person that shared the calendar; and FolderId, which is a very long string (hex?). These are XML elements, and we only need the text values, nothing else. Add a new calendar as above, but in the 'Primary email address' field, use the email address of the person that shared the calendar - not yours. Use your Netlink ID in the 'Username' field. In the 'Share folder Id' field, add the hex value of the FolderId element (from the shared_metadata.xml file). That should be it. I've had no trouble with this setup, other than being unable to see nested folders - but this problem has been there for ages. For example, I have a folder for the Humanist list that I've placed inside a 'Lists' parent folder. Thunderbird shows me the Lists folder, but not the Humanist folder. This is true for all folders more than one layer deep. I wanted to create a new 'sub-repo' in the main hcmc repo for the SVG graphics I've been re-producing ('brand' grpahics and so forth), but I forgot how to add a sub-dir to an existing repo without checking out the parent - and I definitely didn't want to do that. Now I can populate the graphics dir and svn commit. This process requires that a DHCP template get created for our VLAN. Note that, although it can technically go anywhere, it must end up where the DHCP template expects it to be. I've run through this four times successfully, so I'm calling these instructions final. MS SQL Server Management Studio: available from the download window on above URL. Once everything is installed and configured, make sure that MS SQL Server and MySQL server are running (type services.msc at a command prompt). Import CGWP data using SQL Server Management Studio. Connect to Server popup should provide sufficient default settings. Click 'Connect'. Object Explorer displays a list of objects, including 'Databases'. Right-click 'Databases' and choose 'Restore Database...'. To restore from the CGWP dump, Choose 'From device' as the 'Source for restore' and click the browse button to find the dump file. Select the binary dump file (you need to choose 'All Files(*)' in 'Files of type' before you can see the file). It will show up in the 'Select the backup to restore' list if the file is usable. Check the 'Restore' box beside the backup set you want to restore. In the 'Destination for restore' field, copy the name of the backup set from the 'Select the backup sets to restore' panel. A database with this name will be created as part of the restoration process. Click 'OK'. Note that you will get an error if you try to restore a backup set to a database with a non-matching name. You should get a message telling you that the restore was successful. You can quit the Management Studio now. NOTE: everything about the MySQL Workbench under Windows seems a bit sluggish. Be patient after clicking buttons. We need a connection to a running instance of MySQL. On the MySQL Workbench home page, click on the ⊕ beside 'MySQL Connections' at the top of the page to launch the 'Setup New Connection' wizard. Provide a 'Connection Name'. Click 'Configure Server Management...' button (bottom-left) to launch the 'Configure Local Management' wizard. On the first page of the 'Configure Local Management' wizard, click 'Next'. You'll be prompted for the MySQL root password. Provide it (select 'Save password in vault' or you'll have problems later). Click 'OK'. As long as a connection could be made, this page ('Testing the Database Connection') is merely informative. Click 'Next'. If there is only one instance of MySQL running, click 'Next' on the 'Set Windows configuration parameters for this machine' page. As long as a connection could be made, this page ('Testing Host Machine Settings') is merely informative. Click 'Next'. Review settings or click 'Continue'. Back in the 'Setup New Connection' wizard, click 'OK'. Choose the 'Database Migration' shortcut on the right. If you have already set up a system DSN for the MS SQL DB, click on 'Start Migration'. If you haven't, create one now. Click the 'Open ODBC Administrator' button. Choose 'System DSN' tab and click the 'Add...' button. Click the 'Start Migration' button. On the 'Source Selection' page, choose 'Microsoft SQL Server' as the Database System, and 'ODBC Data Source' as the Connection Method. You should see the DSN you created in the 'DSN' filed. Remove 'sa' from the 'Username' field if present. Click 'Next'. On the 'Target Selection' page, choose the 'Stored Connection' you made in step 1. Click 'Next'. The 'Fetch Schema List' page should complete on its own without configuration or interaction. Click 'Next'. On the 'Schema Selection' page, choose the database you want to migrate (it will have the name of the database you restored in MS SQL Server Management Studio). You can leave the 'Schema Name Mapping Method' alone. Click 'Next'. The 'Reverse Engineer Source' page should complete on its own without configuration or interaction. Click 'Next'. On the 'Source Objects' page, you will be prompted to select the objects you want to migrate. In this case we have: 'Migrate Table objects'; 'Migrate View objects'; and 'Migrate Routine objects'. I have been unsuccessful in migrating anything other than the tables, and, having looked through the views and stored procedures (aka Routine objects) I think it's safe to ignore them. The 'Migration' page should complete on its own without configuration or interaction. Click 'Next'. On the 'Manual Editing' page you can review any objects before the actual migration takes place. I consistently get 55 warnings and no errors. The warnings I've seen are collation issues (e.g. 'Collation SQL_Latin1_General_CP1_CI_AS migrated to utf8_general_ci') and NULL value problems (e.g. 'Default value N'NA' is not supported.' and 'Default value N'SUR' is not supported.'). As far as I can tell, they can safely be ignored. On the 'Target Creation Options' the only thing selected by default is 'Create schema in target RDBMS'. This is sufficient for our needs. Click 'Next'. If this is the first time through, the 'Create Schemas' page will run on its own. If it finds an existing MySQL schema you will need to allow MySQL Workbench to drop it. The 'Create Target Results' page allows you to edit the individual SQL solutions produced by MySQL Workbench to do the actual migration. Leave this alone. Click 'Next'. On the 'Data Transfer Setup' page 'Online copy of table data to target RDBMS' should be checked. You can also opt to create a batch file that will 'copy the data at another time'. Click 'Next'. Copying the data will take a few minutes, and a progress bar will be displayed while the copy is running. Anything else is likely the result of a config error. Select the 'Change the default database to:' option to include the database in the DSN - it's helpful. The name of the database will show up in the dropdown list as long as a connection can be made. Other than this, leave the other settings alone. You can leave the settings on this panel alone. Click 'Finish' button to review/test the config. Note that a successful config/test connection does not always mean that you won't have problems later in the migration process! MySQL Workbench can also dump the data from the new MySQL database. Just open up the MySQL connection that you created at the beginning and select 'Data Export' from the navigator on the left. There's a lot of data, so be sure to select complete insert statements in the advanced export options. Except, it looks like eXist may have a bug in there, because the above produces html without a doctype. To get around this use xhtml5 instead of just xhtml in the output:method declaration. Also, we're using "text/html" for media-type instead of "application/xhtml+xml" because some stuff just doesn't work using xhtml+xml (Google Maps, specifically). After numerous tries with various approaches, I finally managed to end up with a 40 Gig virtual machine to host Windows. - clone the existing hard drive using the function in the GUI of Virtual Box (and not the command line). VB created a new folder and put the new virtual machine file into that folder. - click on settings, click on disk, right click, choose "Remove"
- right click on existing small partition, select "extend"
When I tried using the command line to clone the virtual drive, I got the file, but the GUI in Virtual Box didn't see it. I tried a couple of other partition managers before stumbling on the Windows Computer Management and either I couldn't get them to install properly or I couldn't get them to extend the smaller partition to a bigger one. http://tips.kaali.co.uk/2012/03/16/expand-or-increase-the-size-of-virtual-box-vdi-dis/ though I did not create the hard drive and then clone the existing drive to the new drive as that page says, rather I cloned the existing drive and then resized it to 40G. Finally, when I started windows in the new virtual machine, I got a "this copy of windows may not be authentic" warning. I followed the link on the warning and that "authenticated" my copy. Looking at the Jenkins interface this morning, I realized that I'd forgotten to give the anonymous user read access to jobs, so I've done that. I also tracked down the issue with the stylesheets to (I think) a permissions problem with the oXygen installation; it was installed via sudo, so all the files ended up owned by root, whereas the job is running under a different user. I've chowned everything to hcmc:hcmc, and we'll see if that solves it, but it might have to be chowned to whatever user Jenkins runs under. Running a stylesheet build now to see if it works. EDIT: But it doesn't. The same error shows up even when java is world r-x. Posted on the oXygen forum for a possible solution, and also heard from SR that he remembers this but doesn't remember how he fixed it. Update from Stewart 20120622: the dbadmin says that the originating request is supposed to go through helpdesk@uvic.ca, who forwards it on to dbadmin@uvic.ca. Whether or not you will be using drupal for this instance. Not sure whether he actually means only MySQL, or whether PostgreSQL falls under this new support email as well.